This week, the world celebrated Sound Engineer's Day, but can you guess what day this was? Well, it was on 12-12-12 of course, or 1,2;1,2;1,2! Joking aside, behind the thousands of broadcasts that are happening all around the world at only one moment, there's an invisible army of engineers who make the whole process happen, so that sound waves leaving a presenter's mouth can be captured, converted into electromagnetic signals, beamed through the air, and then picked up by your radio, so that you can listen. To find out how, we're joined now by John Adamson who's the BBC Production Editor for London in the Southeast and he's known colloquially as "the Digital Doctor'. Hello, doc. John - Hello. Good evening, to you. Chris - Good evening, John. So did you celebrate Sound Engineer's Day? John - I was very busy at work, dashing back and forth between London and Tunbridge Wells, and unfortunately, I missed that moment. I was hoping to catch 12:12:12, 12/12/12 on the screen, but a phone call came in and I missed it. Isn't that dreadful? Chris - I intended to observe it too, but then I think something cropped up on the television, another form of broadcasting. So tell us John, when I'm speaking, what actually is the journey between this studio where I'm sitting and a radio in someone's car or their living room? John - Starting at the beginning, your voice generates mechanical vibrations that have to be picked up by something called a transducer and that would be a microphone, and that converts the mechanical energy into electrical energy. That tends to be an absolutely tiny signal at that point, so you can't do a great deal with that. You need to amplify it so it's useable. The next thing you would find in the transmission chain is an amplifier that would boost the signal by probably around 70 decibels. So, in the trade, we work at 0 decibels as a standard level for everything we do in broadcasting, that's just under a volt of audio. If you imagine a microphone produces -70dB or thereabout, this is brought up 0dB. Then of course, we want to do more than just broadcast the microphone, as much as it's nice to hear your voice of course! Probably, other things you want to hear like CDs, vinyl, maybe cassettes, mini disc, mp3 players, things like that - all sorts of audio reproducer systems in the chain these days. So, they would be fed into an audio mixer and that's just a clever system of mixing what you want to hear and routing it to the transmitter. You might have in your studio, I imagine you probably have about 12 channels of mixing on your desk there, maybe slightly more. Chris - So when people say, "mixers" what you are referring to is a desk with all these sliders on it that you can move up and down, and they change how loud any individual source is. Presumably, they're basically varying their resistance, so the current has to flow for a bigger or smaller resistance to make it louder or softer? John - That's exactly right, yes. If the fader is fully closed, it presents a short circuit to the input of the amplifying stage. If it's fully open then all the signal that's coming in from the other side of the fader gets transferred across to the output stage. So, you have a mixer and that mixer might have some clever things like pre-fade channels on it so that as a broadcaster, you would want to hear the signal before you go live. You want to make sure it's working at the right level. So in the case of bringing me up on your sound desk at the moment, you would've talked to me off air, checked on pre-fade that you're hearing me and then when you're happy with it, you would open the fader and then I would be routed to the transmission chain, in the way that you are. Chris - What about the level, John, because one of the things that we're all watching in a studio is how loud things are, how soft things are, and we're tweaking knobs and things to make sure that things don't get too loud or soft. But is there also work going on behind the scenes to make it sound very consistent? Because one of the things people notice when they're tuning into their radio, in their car or at home, is the sound level is always nice and consistent. John - That's right. In the early days, we didn't have any sort of processing other than a protection limiter on the end of the audio line feeding the transmitter. That was all well and good, it stopped distortion because the transmitter circuits could only cope with a certain amount of level, +8dBu (decibel unloaded) is what we term the maximum level in the business. But the difficulty is that music, in particular, has quite a dynamic range, so you want to be able to compress that a bit especially for people who are listening in less than ideal conditions. You know, people are listening in their cars or maybe they're listening in the kitchen, and the kettle is boiling at the same time or the vacuum cleaner is on. All these things may be happening which make it difficult to cope with the wide dynamic range. So, what we do is we process the signal. We compress it and in the early days, it was a simple compressor which might put in about 12dBs of compression. So in other words, if anything above minus 4dBu came in, that was compressed to be the same level. Chris - In other words, you're narrowing the gap between the loud bits and the soft bits so you can make everything a lot louder because the peak is not going to be super loud, but then the quietest bits are not super quiet either, so it's normal and consistent. John - Indeed. Now, if you were to listen to perhaps radio 3 on FM, they still broadcast a very wide dynamic range whereas if you listen to radio 1, the other extreme, it has hardly any dynamic range at all. Chris - It sounds very loud, doesn't it, when you hear the relative difference between the radio stations. John - Yes. Originally, we just had compressors and compressor limiters in the chain, but now, we have audio processors. And what they do, is they chop up the audio spectrum from 30 Hertz to 15 Kilohertz into different frequency bands, and they individually compress all these. So that means, you can make the sound even louder. Some people may remember the Phil Spector sound from the '60s, the "Wall of Sound", it was called. That was that principle, where every part of the audio spectrum was squeezed to the absolute maximum, so you had this - as they called it, Wall of Sound - very, very loud, very consistent, ideal for listening in less than ideal conditions. Chris - A lot of people say they're very fatiguing to listen to. Just very briefly, so once we actually get to the transmitter, most people listening to these programmes are probably going to be listening on FM. What just briefly is FM? John - Two sorts of modulation systems that we've had for a great number of years, AM and FM. AM stands for amplitude modulation, FM stands for frequency modulation. So, in the case of AM, amplitude modulation, the intensity of the transmitter signal is varied according to the amplitude of the audio. But in FM, it's the frequency of the transmission that's varied according to the amplitude of the audio. So in the FM system, radio Cambridgeshire operates on 96 megahertz. The loudest passages would cause it to swing back and forward between 96.1 and a bit and 95.8 and a bit. Chris - So actually, although you're tuned to 96, it's actually a little bit either side of the 96 which is wiggling in the spectrum, and that's what your radio is picking up on. John - Indeed, and that requires a clever decoder in the sets that will allow you to do that. Unlike the days of AM where you could just have something simple like a crystal set which could decode the AM signal. With FM, you need a more elaborate detector. Chris - And given that FM is stereo as well, does that mean you're actually broadcasting two sets of information, one corresponding to the right speaker, one corresponding to the left, and they're both wiggling around 96 megahertz? How are you doing that? John - Well, that is true, but it's a bit more complicated than that because if you go back to the history of FM or VHF as we used to call it, back in 1955 when it was opened, we just had a mono signal. So, all we were presenting to the transmitter was an audio signal from 30 hertz to 15 kilohertz and that was mono. Then someone developed the stereo system, but of course, you needed compatibility between the stereo system and the old mono system. 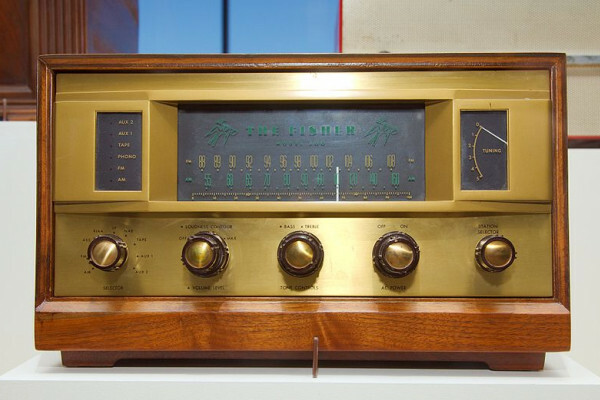 So, to transmit left and right would be a problem because how would an old radio which didn't have a stereo decoder in it know what this signal was? So what we did is we developed a pilot tone system and continued to broadcast the mono signal between 0 and 15 kilohertz. But then we took the stereo information, the difference signal if you like, and added that to the FM signal, but stuck it on a subcarrier of 38 kilohertz which meant that if you had an old mono receiver, it didn't pick up that signal. It was quite happy. But if you had a stereo decoder, it would decode the 38 kilohertz subcarrier frequency information along with the mono signal, combine them together and bring it back to left and right.